The RLE system comprises an RLU laser unit and one or two RLD detector heads. 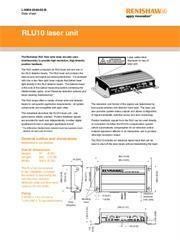 This data sheet describes the RLU10 laser unit. HS20 long range laser encoder. The ultimate accuracy of a laser interferometer combined with the robustness needed for machine tool applications. Laser interferometer encoders provide the ultimate accuracy in linear position feedback.